Booth #2357 Free Exhibits-Only Pass today: https://l.feathr.co/floor19-exhibits-only-quickflash-weatherproofing-products-inc. 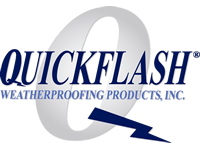 Located at 4129 Wagon Trail Ave., Las Vegas, NV 89118 Quickflash Weatherproofing Products, Inc., was incorporated in January of 2001. We are celebrating our 16 year anniversary. Quickflash is the only company in the USA to manufacture flashing panels for the exterior vertical wall plumbing, electrical and HVAC penetrations. Across the country, water damage and leaks are the major concerns to builders, architects, insurance companies, and potential homebuyers. Quickflash provides a simple and affordable solution to this growing and costly problem.